Following Wirral’s planning committee refusing the application for a fire station on Saughall Massie Road, the Fire Authority met yesterday to decide what to do next. Along with my colleague Cllr Bruce Berry and Les Spencer, Chair of the Saughall Massie Village Conservation Area I attended the meeting. One of the Labour members on the Authority called local residents ‘Snobs’ for opposing the first application and suggested that Saughall Massie residents are only interested in their house values and the Chair of the Authority said the way Wirral Council behaved was despicable, and he suggested that all those Councillors who spoke against this application and voted against should hang their heads in shame. After they had finished insulting residents, Councillors and the Council, the Authority resolved to submit an amended planning application in the next few weeks, as well as considering an appeal to the Planning Inspectorate, and consider requesting that the Council pays the costs. Clearly we need to continue to oppose this attack on our green belt and the amenity of local residents, particularly those who are elderly and infirm who live in the nearby sheltered housing in Woodpecker Close and on Saughall Massie Road and to that end we have set up an online petition which can be accessed HERE You can also help by clicking HERE and printing off a hard copy petition, collect as many signatures as you can and return it to me, Bruce or Steve at our home addresses. Alternatively you may want to return petitions to me, Steve and Bruce between 11am and 11:30am on Sunday 19th February when we will be outside the Willows Pub on Saughall Massie Road. As soon as the planning application is submitted we will let people know. In the meantime please sign the petition and ask your friends to do so to. Sadly we have to fight this all over again. Sadly this evening at Wirral’s Business and Overview Scrutiny Committee, 9 Labour Councillors rejected my proposal to ask Cabinet to ditch their proposals to introduce parking charges in our Town, and other town centres and Country Parks. I have reproduced my proposal below. 1. Committee notes the numerous petitions of objection, totalling over 15,000 signatures to date. 2. Committee notes the level of public anger and opposition to these proposals. 3. Committee recognises the potential damage the introduction of car parking charges will do to the already struggling town centre shopping areas. 4. Committee also recognises that charging for parking in Country Parks, with an estimated drop in usage of 30% of users will have a detrimental effect on public health. Therefore committee asks Cabinet to withdraw these proposals in their entirety, and, instead work with our local business and town centres to help regenerate our towns. While we may have lost the vote this evening, Cabinet will make the final decision so it’s important people do two things to keep the pressure on the Council. I reported earlier this week about the sale of the Millhouse Pub Site from Galliford Try to the Symphony Housing Group. As you will read they are going to ditch the plans for 38 apartments and submit a planning application for 28 x 2 bedroom 3 person flats for rent or buying, this seems to me to be a more acceptable proposal. Many thanks for your e mail raising your concerns about the Millhouse site. LHT purchased the site from Galliford Try in Mid November 2016 with planning as mentioned in your email. In our view the scheme with planning was too dense and we had indicative plans drawn up to enable a firm bid to be submitted to the HCA for 28 x two bedroom 3 person flats for rent to buy (general needs). I am pleased to tell you that this was successful and that we now have a grant allocation for the site. As you observed, we have tidied and fenced the site and understand that there are no current concerns from neighbours about anti-social behaviour. We are about to tender for demolition works to clear the site. We are working with the Local Authority, have started all the site investigations and have a meeting in place this week with the architect to move the site forward. Our aim is to have a 2017/18 start on site subject to the revised planning. We would be delighted to meet with you, maybe on site, to discuss our plans and to that end, I have copied in my colleague Lin Powell who is leading our work and asked her to get in touch with you directly. I trust that this is of assistance. Symphony Housing Group describe themselves as the largest registered social landlord based solely in the North West. With over 41,000 properties, we operate across 30 local authorities and we are committed to supporting the regeneration and sustainability of the North West. I have sent Bronwen Rapley, Group Chief Executive an email asking what plans Symphony has for this site. I have reproduced that email below. As soon as i get a response I will of course ensure local residents and the wider community are informed. As you will be aware a planning application, APP/14/00706 for the Demolition of The Millhouse public house and erection of 38 residential apartments for older people (over 55s) and other associated development including hard and soft landscaping, boundary treatment, car parking, and alterations to access from Millhouse Lane. ( amended proposals, reducing number of units, increasing car parking and alterations to elevations) was refused unanimously by Wirral’s Planning Committee on the 22nd October, 2014, however the application was subsequently allowed at appeal. 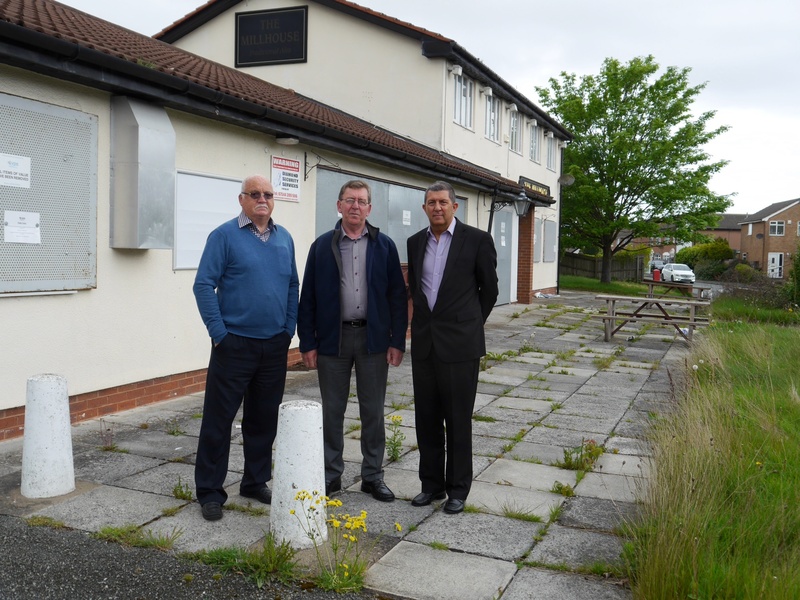 Since the appeal was allowed by the planning inspectorate in 2015 the site has been left to deteriorate and has become an eyesore to local residents, a real blot on the landscape, and indeed, until it was tidied and fenced off was a magnet for fly tipping and anti-social behaviour. As one of the three Ward Councillors for the area, along with local residents we are keen to see this site redeveloped and brought back into use as soon as possible. I would very much appreciate it if you could tell me if it is Symphony’s intention to build in line with the current approved planning permission, or do you have other plans for this site? It appears that the Chief Fire Officer is prepared to keep squandering public money in order to force this unwanted fire station on a community, who have made it abundantly clear that they don’t want it. We will of course oppose any further attempts to build at this location. The Fire Authority meeting starts at 1pm and is being held in the the Liverpool Suite at Merseyside Fire and Rescue Service Headquarters, Bridle Road, Bootle L30 4YD. The meeting is is open to the public, so if you want to attend you are very welcome to do so. Shoppers in Moreton are being urged by the Town’s traders to help them to ditch Town Hall plans for ‘pay and display’. The Town Hall claims parking charges would bring in £40,000 a year but this figure has now been questioned by one of the local Councillors as ‘fantasy figure scribbled on the back of a fag packet’. An online petition organised by Pillar Box cards in Moreton (https://you.38degrees.org.uk/petitions/say-no-to-car-parking-charges-in-moreton <https://you.38degrees.org.uk/petitions/say-no-to-car-parking-charges-in-moreton&gt; ) states that car parking charges will have the same result that has been seen in other parts of the Borough, such as Liscard. I am astounded that that Wirral Labour want to introduce parking charges in our struggling shopping areas. We have all seen the decline of Liscard because of parking charges, we don’t want to see that decline replicated across the borough. Instead of wasting £247,000 on a monthly newspaper, and up to know over £850,000 on their pet Hoylake Golf Resort scheme, as well as finding £80,000 a year to employ yet another senior officer, they would be better investing in our towns and shopping areas to make them more viable and vibrant. Here in Moreton we are working with Council Officers and local business to try to regenerate our town, to bring empty shops back into use and give a greater shopping experience. Introducing car parking charges will destroy our town centre shopping areas by driving custom away to areas where car parking is free.